Check out this lovely lemon wake up call! 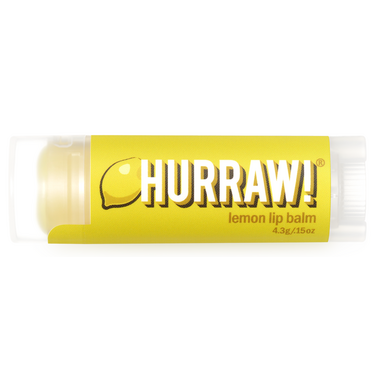 Blended with a smidge of Malagasy lemongrass to give it an extra lemony kick, this lip balm pretty much rocks the lemon gods. Ingredients (INCI): Carthamus tinctorius (safflower) seed oil*, Prunus amygdalus dulcis (sweet almond) oil*, Euphorbia cerifera cera (candelilla) wax, Theobroma cacao (cacao) seed butter*, Cocos nucifera (coconut) oil*, Ricinus communis (castor) seed oil*, Simmondsia chinensis (jojoba) seed oil*, Olea europaea (olive) fruit oil*, Citrus limon (lemon) peel oil, Tocopherol, Cymbopogon flexuosus (lemongrass) leaf oil, Citralه, Geraniol, LimoneneǇ, Linalool (Ǉnatural component of essential oil) *certified organic ingredient 84.1% organic 14.7% wild grown 100% natural Hurraw Balm is certified organic by the Montana Department of Agriculture and COSMOS Natural certified by Ecocert. If you have a nut allergy Hurraw! advises you to NOT use this product!